Triple Fruit Slab Pie and a Kitchen Aid Stand Mixer Giveaway! I have a pie problem. …It’s not the crust. It’s not an inability to make it. It’s not a dislike of it -no- it’s quite the opposite. The problem is this; when I make pie I absolutely, positively cannot stop eating it until it is gone and the last of the crumbs have been licked off of the counter top. Yes. I have licked crumbs from the counter top. Every year when mom asked what I wanted for my birthday cake, I answered, “Blueberry pie!” My poor mama. She has a pie crust making phobia. It was not my kindest moment, but as I said, we were talking what I wanted and I wanted pie. I always want pie. And while blueberry pie is my perennial favourite, I love all pies. 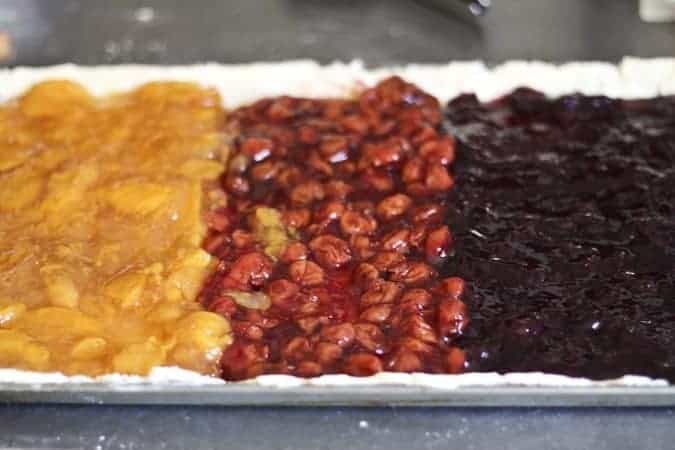 Most especially, I love fruit pies -blueberry, apple, cherry, rhubarb, grape, strawberry, peach, pear- and cream pies and custard pies and every combination thereof. No pie is left behind in my world. Pie is the most superior dessert because if you turn it over (TURNOVER. PIE JOKE. Don’t worry. I only have 3.1412 jokes left. MORE PI JOKES. And another. Oh shoot. I’m sorry.) in your mind, it’s the perfect combination of filling to crust. Cake is one giant crust gobbed with icing or frosting (which I will eat happily, but we are talking about why pie rocks the world.) Besides, it’s really kind of, almost, maybe, potentially health food. Well, a fruit pie is anyway. Don’t even talk sugar. I don’t care. That’s a lot of fruit in one sitting. It’s gotta be good for you! Participating in pie week was a natural for me, but I frozen when it came to which pie to feature because all the pies in the world call my name. I decided to go with a Slab Pie; a crowd-pleaser, both for it’s large size and for it’s versatility. In my case, I opted for three different pie fillings to make it an even bigger addition to the please them all file. This is only true, of course, if you’re serving it to pie lovers, but hey… if they don’t love pie, I’m not sure how to help them anyway. The beauty of a slab pie is sheer acreage, really. It’s everything wonderful in a pie, but with a little more crust in each bite, and a customizable filling. 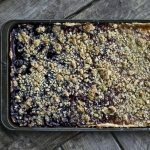 It’s nearly impossible to make a regular pie with three different fillings so clearly delineated, but it’s easy as, um, pie (even I’m cringing over that one) in slab pie format.I love to top mine with gorgeous crumbly crisp topping. It cooks faster, allows you to look at the ‘innards’ of the pie and the crust more clearly to tell when it’s done, and pairs beautifully with a scoop o’ ice cream melting on top. Truth is, it’s the best of pie and the best of crisps/crumbles all in one lovely, rainbow-hued package. 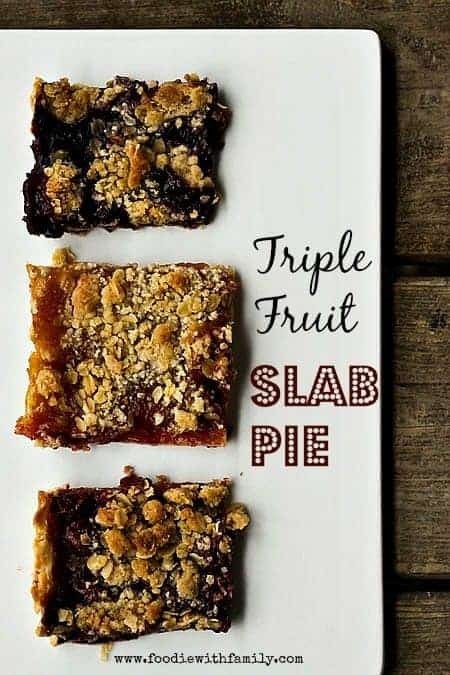 What fruit fillings are you likeliest to use for a slab pie? 2 1/2 cups of pre-made Big Batch Crisp Topping ~OR~ 1 stick softened butter 1/2 cup oats, 1 cup white whole wheat flour, 2/3 cup brown sugar or raw sugar, 1/4 teaspoon salt, and a dash each of cinnamon and nutmeg, beaten together in a stand mixer or with a hand mixer until the butter is evenly distributed and the mixture is crumbly. Roll out the pie pastry to a rectangle that is slightly larger than a 10-inch by 15-inch jelly roll pan. Greasing the pan is unnecessary. Carefully lift the pie pastry onto the pan and press the crust down gently so that it fits nicely into the pan. Trim any overhang with scissors or a sharp knife. Position the jelly roll pan so a long side is running parallel to the edge of the countertop. Scoop the first type of pie filling so that the left third of the crust is filled. Repeat with the second pie filling in the center third, then the third pie filling in the far right third. Scatter the crisp topping evenly over the entire slab pie. 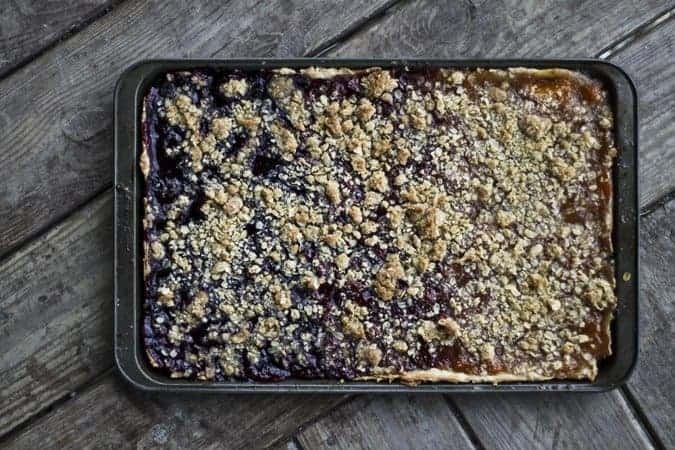 Place the pan on a sheet of aluminum foil that is slightly larger than the pan (to contain any potential bubble-overs) and bake for 40-50 minutes, or until the filling is bubbly, the crisp topping has begun to brown, and the visible pie crust is golden brown. Let rest until room temperature before cutting. That slab pie is kind of a work of art! I love that there’s a fruit in there for everyone, no matter what your preference. 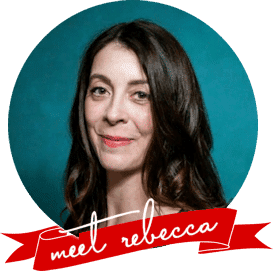 Beautiful pie, Rebecca! I love the three different flavors. Genius! I wish I had loads of canned pie filling in my pantry…I would probably just eat them with a spoon and not even bother putting them into a pie. This looks amazing though and I love the ease of a slab pie! I’ve never heard of slab pie, but oh my! These look so pretty! I want to eat them all! 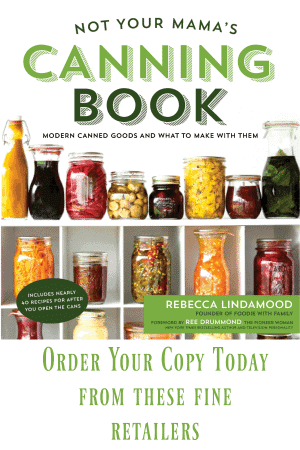 Would you be willing to post your recipes for the canned pie fillings? This is genius. Serious acreage of a pie with 3 different flavors! This is genius! The three different fillings? That’s just brilliant. I would love to make homemade salsa! Looks like this is gonna be one tasty pie. Cant wait to make it.